7 Feb 2019 – If I know anything, it is about people, such as you, I am a man of the people. I was born and raised in a poor neighborhood of Caracas. I forged myself in the heat of popular and union struggles in a Venezuela submerged in exclusion and inequality. Venezuela is a country that, by virtue of its 1999 Constitution, has broadly expanded the participatory and protagonist democracy of the people and that is unprecedented today, as one of the countries with the largest number of electoral processes in its last 20 years. You might not like our ideology, or our appearance, but we exist and we are millions. I address these words to the people of the United States of America to warn of the gravity and danger that intend some sectors in the White House to invade Venezuela with unpredictable consequences for my country and for the entire American region. President Donald Trump also intends to disturb noble dialogue initiatives promoted by Uruguay and Mexico with the support of CARICOM for a peaceful solution and dialogue in favour of Venezuela. We know that for the good of Venezuela we have to sit down and talk, because to refuse to dialogue is to choose strength as a way. Keep in mind the words of John F. Kennedy: “Let us never negotiate out of fear. But let us never fear to negotiate”. The political intolerance towards the Venezuelan Bolivarian model and the desires for our immense oil resources, minerals and other great riches has prompted an international coalition headed by the US government to commit the serious insanity of militarily attacking Venezuela under the false excuse of a non-existent humanitarian crisis. Today Venezuela is united in a single clamor: we demand the cessation of the aggression that seeks to suffocate our economy and socially suffocate our people, as well as the cessation of the serious and dangerous threats of military intervention against Venezuela. 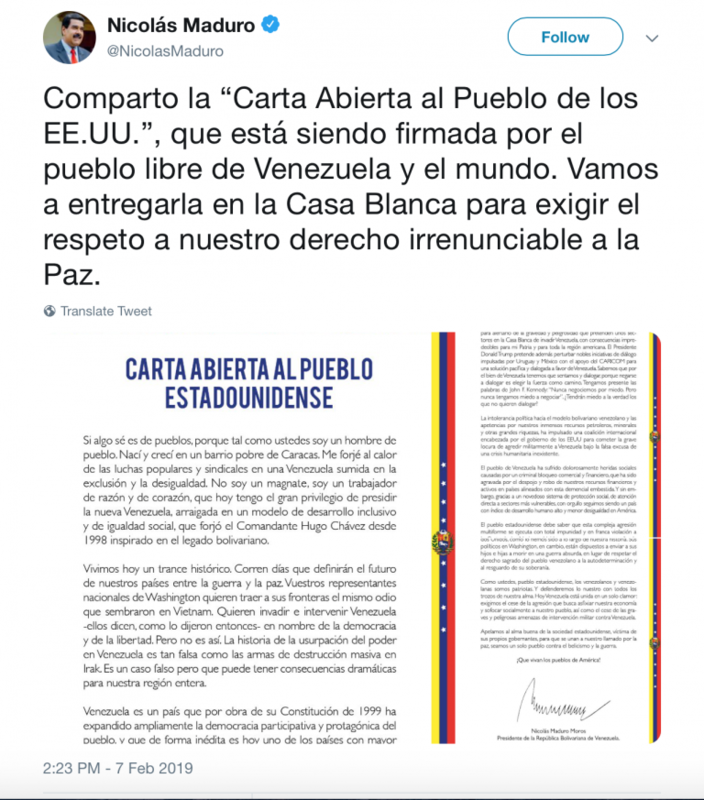 The original source of this letter is the Bolivarian Government of Venezuela. Leave Venezuela be! NO INVASION BY US MILITARY!!!! Stop the meddling, the hatred! I am embarrassed that my country for over a century has deposed elected leaders and inserted Dictators that will co operate with our desire for money, power and greed. I believe that you should remake in your position and have been praying for a good out come for you and your People. Similarly, I hope you pray that we don’t have to build a wall and hoping to see our holy God. The Grayzone reports from inside Venezuela, where millions of people waited in long lines to sign an open letter to the US public, strongly rejecting foreign intervention in their country.